Electron Ionization (EI) mass spectra contain a vast amount of information that can be considered during an identification procedure. It might be surprising to know that most of us examine and utilize only a part of that information and as a result decrease the probability of a correct identification and in many cases cannot identify the analytes at all. It might also be surprising to know that it is rather easy to consider more of the data and improve identification results. When we analyze an EI mass spectrum we usually relay on library identification, which provides us the most resembling spectra from the library (and with almost no effort on our part). Library identification is an important tool but it has its shortcomings, and it often fails. Keep reading to find out how you can easily increase the probability of a correct identification and identify more compounds, all by using more of the information already found in you spectra. It fails when the fragmentation pattern is too generic and can be related to a class of compounds. The library failure situation is further exacerbated in that the library identification software doesn't know when it fails, and still presents its identification results, often with surprisingly high matching factors and probabilities. 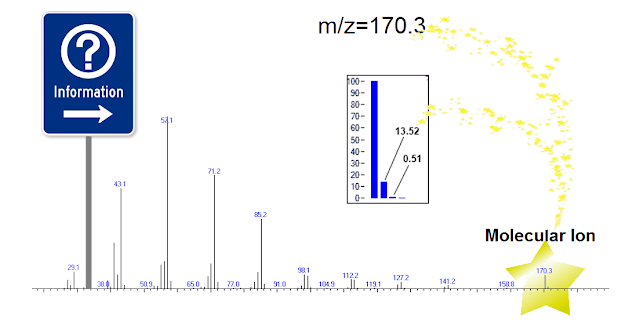 Figure 1 shows the identification results produced by NIST's MS Library Identification software when the analyzed spectrum was that of triacetone triperoxide (TATP) (a powerful explosive). Even though the library failed, the matching factor of the first compound on the list is 704 which is OK and the identification probability is 55.7% while this identification is clearly wrong. It would have been beneficial if we could use more of the information found in the mass spectra, which is ignored by library identification algorithms, in order to enhance and improve the identification process. Fortunately, the data found in EI mass spectra measured by standard GC-MS systems holds several types of informative measurements that can be used in such a way. The first of which is the isotopically determined distribution of the molecular ions and the second is the sufficiently accurate mass of these ions. If the molecular ion is present in the mass spectrum, it appears as a group of several peaks, one atomic mass unit apart, as shown for example in figure 2. 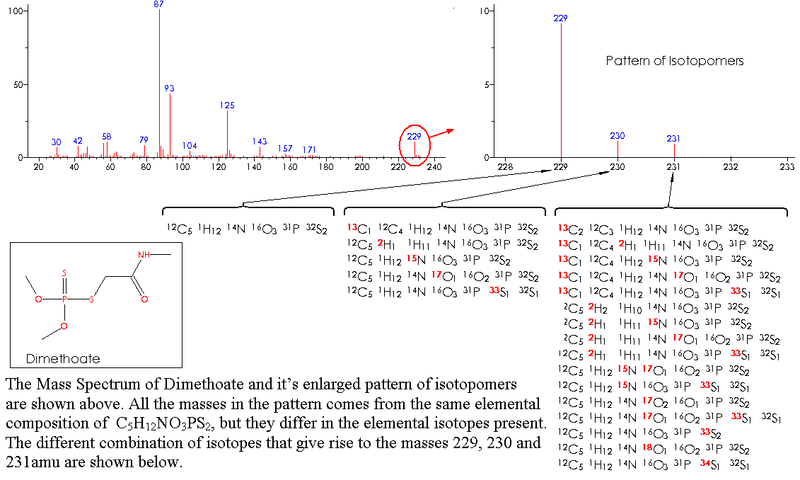 These peaks are the measured intensities of the analyte's isotopomers – which are the same exact molecules with different isotopic composition. These isotopomeric patterns are directly related to the elemental compositions of the analytes, and as a consequence we can use them to scrutinize the library identification results by generating their theoretical patterns and comparing them with the measured data. 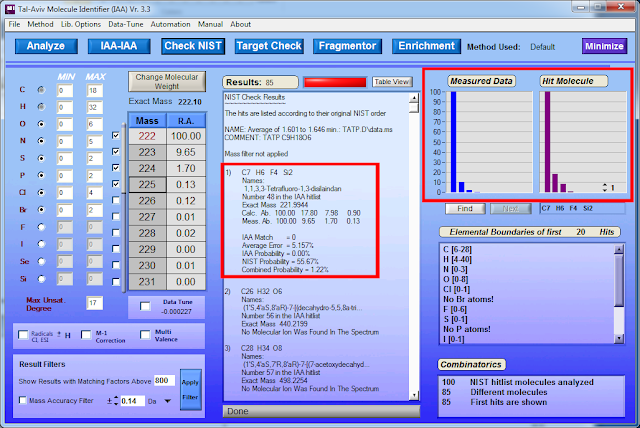 In order to better exploit the extra information found in mass spectra, including isotope related information, we developed the Tal-Aviv Molecule Identifier (TAMI) software. The TAMI screen can bee seen in figure 3. It shows that the measured pattern of TATP (failed to be identified by the library as shown in the previous figure 2) is not similar to the theoretical pattern of the 1st result provided by the library (the measured intensity of the M+1 ion for example is almost half of what we should have seen if the identification was correct). The difference between the two patterns is actually rather large and equal to 5.157%. We note that the TAMI software window is launched automatically when the NIST search is activated, automatically downloading the experimental mass spectral data and performing the analysis. This comparison, made automatically by the TAMI software, corrects the original identification probability of 55.67% and lowers it to the more appropriate 1.22 %, effectively telling us that the library have failed. In such a case it is rather easy to perform an independent analysis of the isotopomeric pattern and look for molecules with theoretical patterns that are similar. The isotopomeric pattern is calculated from the elemental composition of any compound and therefore no library of patterns is needed and such an analysis encompasses all possible compounds. 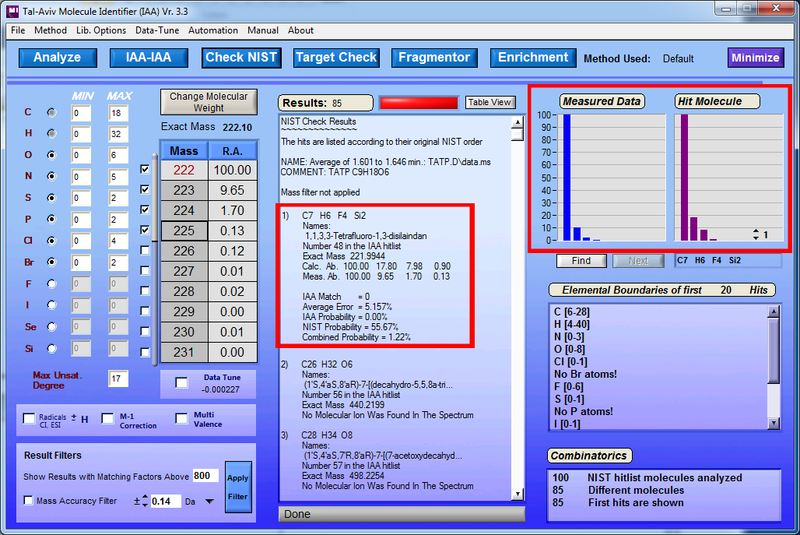 Figure 4 shows the results provided by the TAMI software after the analysis of the experimentally measured isotope pattern of TATP. It has found that the most resembling theoretical (calculated) pattern is that of C9H18O6 which is the correct elemental formula of TATP. Alternatively, the same procedure can increase the probability of successful library identifications as shown in figure 5 where the Dodecane's probability of identification is increased from 42% to 80% thanks to the similarity of the measured isotopomeric pattern to that of Dodecane's (0.197% difference). It might be surprising to know that the mass measured by quadrupole mass spectrometers can be accurate enough and rather useful in terms of identification. 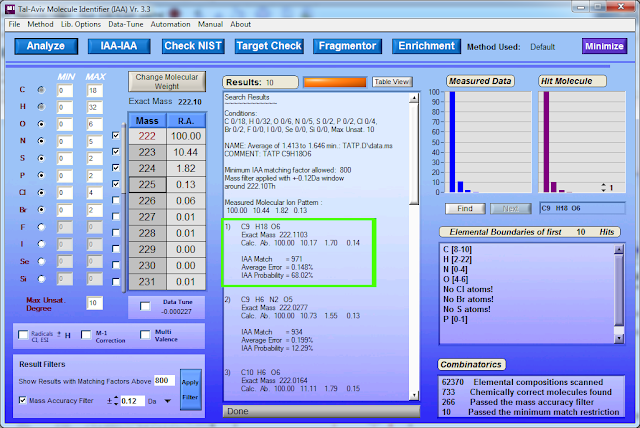 We use an Agilent 5975 and even though we did not calibrate its mass accuracy for years we still get measurements with less than 0.1amu error (and in our experience Thermo's ISQ provides mass measurements within 0.02 amu of the true mass!). This is not accurate enough for precise determination of elemental formulae but it does enable the rough filtering of identification results provided by other means of identification. 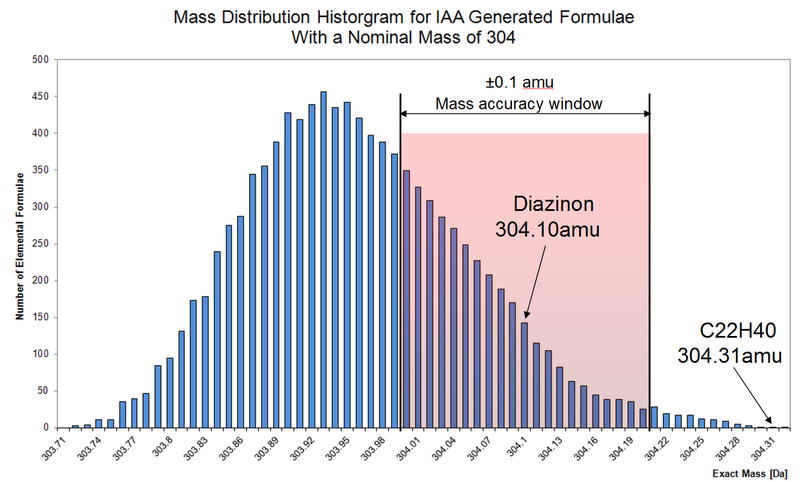 To demonstrate the usefulness of this let's look at figure 6 where we see the exact mass distribution of molecules with the nominal mass 304. This distribution is the result of the small mass defects of the different atoms. The pink area shows a window of +-0.1 amu centered on the measured mass. Notice that the majority of compounds are found outside this window, thus, if the MS is calibrated these compounds should not be considered even if they appear as identification candidates in the library's results or the results provided by isotope abundance analysis (figure 4) as their mass is simply not compatible with the measured data. Figure 6. Click to Enlarge. 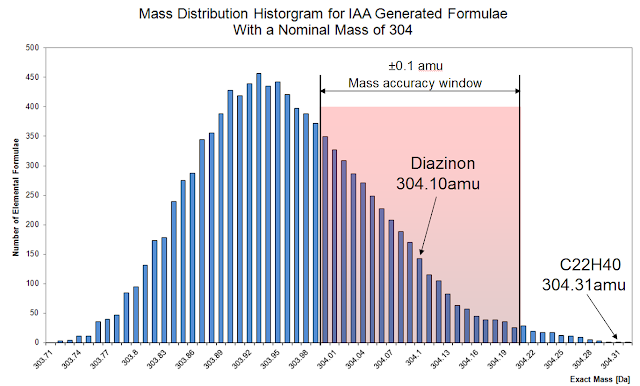 If we measure a mass that is closer to the sides of this distribution, for example when we analyzed C22H40 at m/z 304.3. The filter is even more effective, as it filters out more of the otherwise relevant identification candidates. What we saw so far is that it is beneficial and rather easy to use the information found in the molecular ion's measured mass and isotopomeric pattern and combine it with a library analysis which considers the fragments. These are three totally different analysis methods, each depending on a totally different physical attribute, and their combination provides us with the ultimate compound identification method. Figure 7 shows the analysis of all NIST library (Vr. 2008) compounds with a mass of 304 amu. The Y axis is the difference between a compound's isotopomeric pattern and that of Diazinon (and Diazinon itself can be seen at the origin), while the X axis is the difference between a compound's mass and that of Diazinon. 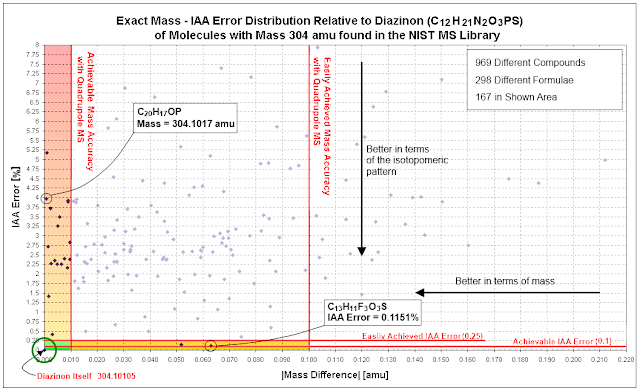 It clearly shows how most of the compounds are filtered out due to big errors in the X and/or Y axis, and how orthogonal these two methods are – as the quadrupole accurate mass rejects compounds with similar isotopomeric patterns and the isotopomeric dissimilarity rejects compounds that are valid in terms of their mass. Figure 7. Click to Enlarge. With this combination the Library's results are automatically scrutinized and if the identification appears to be wrong the molecular ions are analyzed with the abovementioned independent tools with good results. Both additional methods described above use the information found in the molecular ion, and even though most GC-MS mass spectra show the molecular ion it is in fact missing from the mass spectra of many compounds. 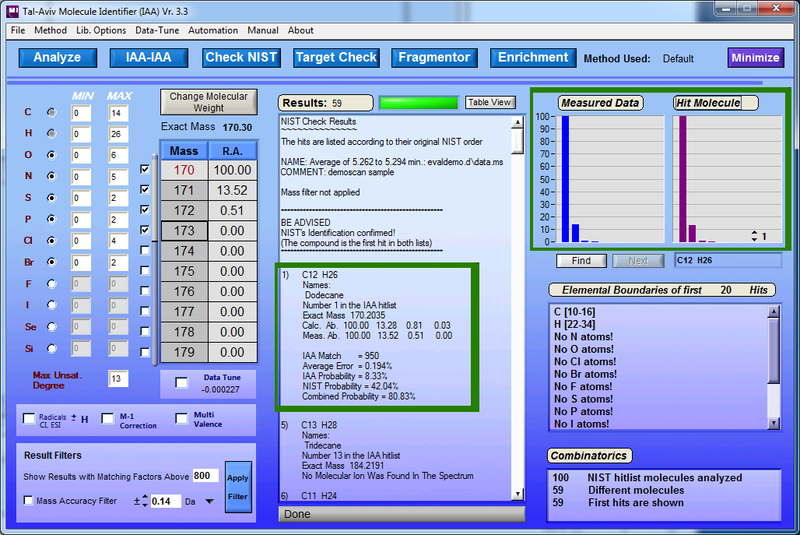 The analysis procedure should of course consider this: for example the TAMI software will inform the user that it cannot contribute through the molecular ion (since it is missing) and one can attempt an analysis on the highest fragment instead. This solution is not as good but it has it merits and without the molecular ion it is the best one can do. The conditions for a successful identification are vastly improved when we use a supersonic molecular beam (SMB) based instrument such as the Aviv Analytical 5975-SMB GC-MS. The Cold-EI interface cools down the molecules in a supersonic molecular beam so that they are less likely to break down in the ionization process. The result is an increased molecular ion, as we can see here relative to the standard EI spectra here. This ensures that the isotopomeric pattern and accurate mass of the molecular ion can be optimally utilized for identification and by itself increase the library identification probability (read more about SMB and Library matches here). GC-MS users can greatly benefit from the information found in the measured molecular ions. 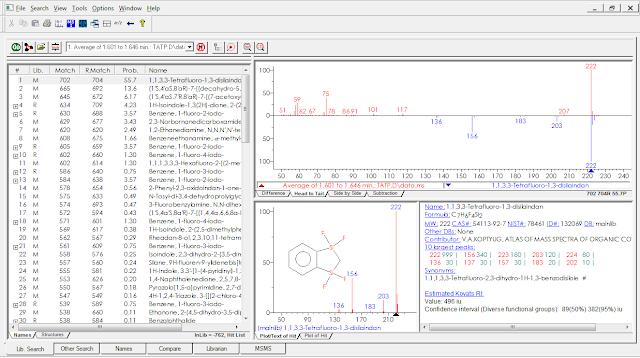 The combination of library identification, Isotope Abundance Analysis and quadrupole mass accuracy filters vastly improves the probability for correct identifications and in many cases enables the identification of compounds that are otherwise unidentifiable with GC-MS.
As demonstrated above, the TAMI software serves as an effective method for improved identification that starts with automatic confirmation or rejection of NIST's identification. In case of a rejection it further serves as an alternative method for the elucidation of elemental formulae with unit resolution quadrupole based GC-MS data, hence with this software, quadruple based GC-MS can compete with expensive high resolution TOF based GC-MS.
We also believe that the Aviv Analytical 5975-SMB GC-MS with Cold EI is the ideal instrument for identification purposes as it provides highly abundant molecular ions, which are the most important ions in terms of identification. Furthermore, the 5975-SMB extendes the range of compounds amenable for GC-MS analysis.